Home / Grantee Spotlight / Corazon Del Pueblo Officially Open! Corazon Del Pueblo Officially Open! On March 31, the Corazón del Pueblo Cultural and Creative Arts Center of the Santa Maria Valley officially opened. The center’s mission is to promote creative expression in all areas of art—performing, visual, and literary—and to offer the community a place to celebrate culture. Executive Director Alma Hernandez and board President (and writer/poet) Samuel Duarte spoke with the Sun about the new center. Sun: How did you get the idea for the center, and how did it get started? Hernandez: Originally when [incidents of youth violence] were happening in 2016 in the city of Santa Maria, the youth were working together as part of the Just Community Summit … they work with local high school students to … come up with solutions for what they can do to make a change in the community … . One of the top solutions they had was the establishment of a cultural art center. They thought they needed a place to build some community, Latino pride, and also have a voice in the community. Sun: Why was it important for you personally to get involved in this project? Duarte: When I came here 10 years ago, there were no venues. There were no poetry groups, specifically, or any real community surrounding the arts. For me, I had to go out of town a lot. That usually meant going to more affluent communities and usually in communities there was not a lot of diversity. … so what we did was we began organizing the 100,000 Poets for Change Event. We did that once a year, and we had a lot of people show up … the whole idea was very important because just to build community around art is really amazing. Art does allow for conversations to happen in a nonconfrontational way, because that’s just what art does. We started talking about the idea of a cultural center eight years ago. And we were approached by a lot of second- and third-generation folks who said this was a longtime dream for us. Hernandez: I completely believe in the effect that art has on raising the consciousness and creating a space for conversations, especially with people who don’t have a lot of understanding of the cultural diversity and challenges … . I’m raising two teenage children who are in the midst of that. They are both biracial kids, and sometimes that can be challenging in the community to try to find identity. Sun: What are some of the things the cultural center will offer? 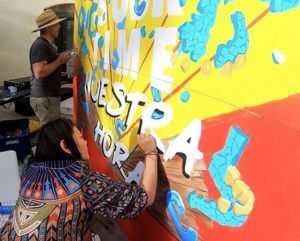 Hernandez: We want to host classes, workshops, art classes—we’ve already had mural classes. We are hosting Juan Felipe Herrera [the first Latino United States Poet Laureate from 2015 to 2017]. We want to not only be able to have classes and workshops and be able to develop those skills and talents, but also be able to connect with leaders who have been able to achieve success and learn from them. Duarte: There is a sector of the community that also likes crafts, so we want to be able to open the space to any ideas that they might have. We want to be really open with things we haven’t even thought about. One of the things I’ve always really wanted to do … is have photography classes that have a journalistic bent. I remember before [digital photography] there were spaces where they used to give kids disposable cameras to take home and take pictures of their home environment. Hernandez: We want to be able to have a space where people can share their stories. It really builds understanding if you realize everybody has a story. That, I think, is where you can find a place to connect … although Corazon del Pueblo will feature a lot of Latino culture, we are also open to learning about other cultures … . Duarte: We also want to break this idea of being an “artist,” a lot of people find that very intimidating … . Sun: What are some of your long-term goals for the cultural center? Hernandez: We definitely want to grow the space. We want to be able to expand and be the hub of arts and culture in the community. And in addition to that, connect with all the local businesses and education institutions, to have an ongoing collaboration to build on what they have, and to build the community workforce, in terms of having more creative people that I know that businesses are looking for … to just be able to make an impact in the community.